Second hits. Genomic disorders are genetic disorders due to recurrent microdeletions or microduplications, i.e. small losses or gains of genomic material that happen again and again due to existing breakpoints in the human genome. Intriguingly, additional large microdeletions or microduplications can be identified in some patients with genomic disorders. A recent study in the New England Journal of Medicine tries to explain why. The genomic disorders. The human genome has a very peculiar duplication architecture; many parts of the human genome are virtually identical resulting in so-called segmental duplications. When these segmental duplications are close to each other, the chromosomal region located between both duplications may accidentally be deleted or duplicated. This process is referred to as non-homologous allelic recombination (NAHR). NAHR is much more frequent than other mechanisms resulting in loss or gains of chromosomal material. If the deletions or duplications result in human disease, these disorders are called genomic disorders. Many neurodevelopmental disorders including Angelman Syndrome or Smith-Magenis Syndrome are genomic disorders. From 1q21.1 to 16p12.1. In addition to clearly defined genetic syndromes with a recognizable phenotype, some genomic disorders have a heterogeneous presentation, i.e. these variants result in different phenotypes. The classic example is the 22q11.2 deletion, which is known to cause DiGeorge Syndrome. However, the same microdeletion has long been known to be a risk factor for schizophrenia and Juvenile Myoclonic Epilepsy (JME). While the phenotypic range of the 22q11.2 microdeletion was already puzzling, other variants turned out to be even more heterogeneous. For example, the 1q21.1 microdeletion was found to be a strong genetic risk factor for a completely unrelated range of developmental disorders, ranging from cataracts to multiple congenital anomalies. In addition, many variants were found to be inherited including the 16p12.1 microdeletion, which is exclusively inherited from unaffected parents and rarely occurs de novo. Both observations, the broad phenotypic range and the inheritance from unaffected parents, suggest that other possibly genetic factors contribute to the phenotype. Microdeletions meet complex inheritance. The term complex inheritance is frequently used to refer to inheritance patterns that are not monogenic. However, despite the frequent usage, few theoretical frameworks exist to explain the interaction between various genetic factors. Girirajan and colleagues suggested a double hit model for intellectual disability based on their observation in patients with 16p12.1 deletions; many patients were found to carry a “second hit”, i.e. a second large microdeletion. In a recent study in the New England Journal of Medicine, Girirajan and colleagues now extend this framework to other microdeletions. The burden of second hits. Out of a large collection of more than 30,000 samples genotyped with array CGH, the authors selected ~2500 patients who carried deletions or duplications associated with genomic disorders. In total, they included 39 genomic regions with 39 possible deletions and 33 corresponding duplications. They went on to analyze these patients for the burden of second or third hits, i.e. additional large deletions or duplications. While they found an average frequency of 10% for second hits, this frequency was highly variable between genomic disorders. In some microdeletions including the 16p12.1 deletion or the 15q11.2 deletion, the frequency was significantly higher than in controls. Interestingly, in some classical genomic disorders including Smith-Magenis Syndrome, the frequency of second hits was much lower than in controls. Overall, the frequency of second hits was elevated when the genomic disorder was known to be variable. Inheritance vs. Second Hits. 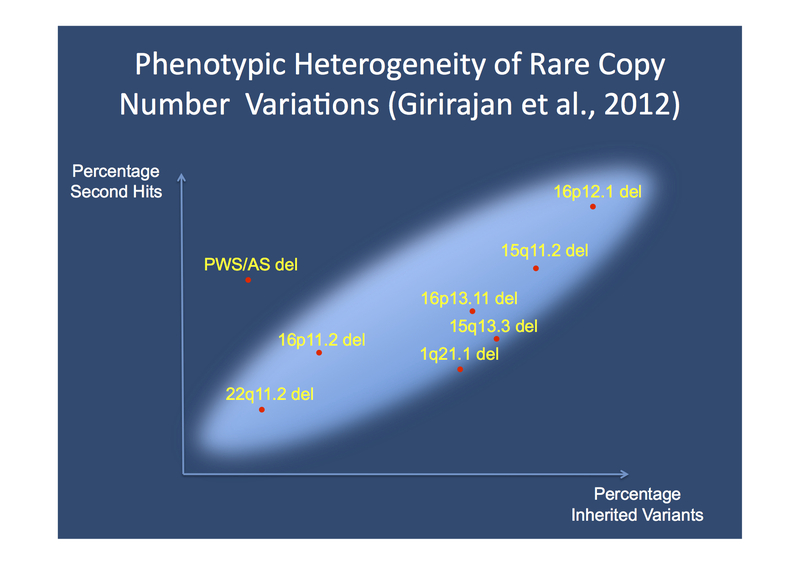 In parallel to their earlier study, Girirajan and colleagues find a correlation between the frequency of second hits and the frequency of inherited variants (Figure). Again, the 16p12.1 deletion represents the extreme end of the spectrum with a high frequency of second hits and a high proportion of inherited variants. Other variants including the 22q11.2 microdeletion have a lower frequency of second hits and more often occur de novo. Many of the variants associated with epilepsy are between these two extremes. The microdeletion resulting in Angelman/Prader-Willi Syndrome represents an outlier with a relatively high proportion of second variants despite a low frequency of inherited variants. The spectrum of epilepsy-related Copy Number Variations (CNVs). The authors observe a correlation between the frequency of second hits and the frequency of inherited primary variants. Many of the epilepsy-associated microdeletions are found in the middle of the spectrum. The 15q11.2 variant is one of the few variants with a significantly elevated frequency of second hits. What does this mean for human epilepsy? While many human epilepsies might be strictly monogenic, a large proportion is unlikely to be explained through a single, causative factor. For intellectual disability, Girirajan and colleagues have suggested an oligogenic model with few high-impact variants resulting in disease. Their theory is backed by their current study; some variants are sufficient to cause disease, other variants are only pathogenic in the setting of a second or third hit. It would be interesting to apply a similar framework to human epilepsies, but studies like this require sample sizes of several thousand individuals. Either way, the current study provides us with a working hypothesis for genetic contribution to disease beyond monogenic disorders. This entry was posted in 2012, IGE/GGE, Publications and tagged 15q11.2 microdeletion, 16p12.1 microdeletion, Copy Number Variations, microdeletions, Second Hit. Bookmark the permalink.